"Residential Recording and Writing Studio in a converted Chapel right by the sea"
Big Jelly Studios is a residential recording and writing studio in Ramsgate, 1hr 15minutes from Central London on the Kent Coast. The converted methodist Chapel was completely rennovated in 2013/14 by Engineer/Producer/Musician Mike Collins and Engineer/Producer Al Harle. Mike was an early member of Soup Studios (now housed at Lightship 95) and a touring musician/composer. Al is a recording and live engineer with over 20 years in the industry. The studio boasts 4 large performance areas with booth options and a dead room, dual (networked) control rooms, a comfortable lounge/dining area, bedroom (with 5/6 beds) and full kitchen & bathroom facilities. Our treated, double height main live room has become one of our most attractive selling features. Couple this with the affordability, a huge selection of instruments & equipment plus the studios location - right by the sea! - and you can see why we have become a popular destination for bands in the last few years. 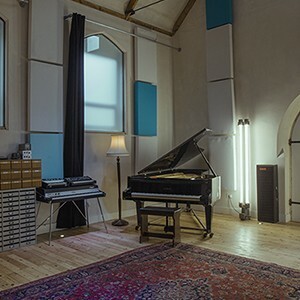 A unique and very affordable residentlal recording studio in Ramsgate.